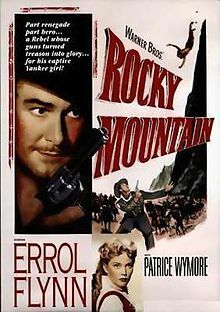 This was the last of Errol Flynn’s eight westerns, and it is better than the previous one (Montana, his last film with Alexis Smith). The Rocky Mountain of the title is not in Montana, or Utah or Colorado; it is on the borders of Nevada and California, and is also known as Ghost Mountain. It is the waning days of the Civil War in March 1865. A small group of men (eight, in total) led by Capt. Lafe Barstow (Errol Flynn) is sent out west by Confederate Gen. Robert E. Lee in a desperate move, to make contact with outlaw Cole Smith. (The premise is similar to that of Hangman’s Knot, two years later.) Smith promises to provide 500 men to make a Confederate force out west and divert Union military resources from the war Lee is fighting in the east. Lt. Rickey (Scott Forbes) and his patrol are captured by Barstow (Errol Flynn), while his fiance Johanna (Patrice Wymore) looks on. As Barstow and his men finally arrive at the meeting point in the desert mountains, they find themselves in danger not only from Union cavalry but surrounded by hostile Shoshonis. They are on the eastern side of the Sierra Nevada, where they can see the Humboldt River and Battle Mountain. They find a crashed stage that had been pursued by the Shoshonis and drive off the Indians. 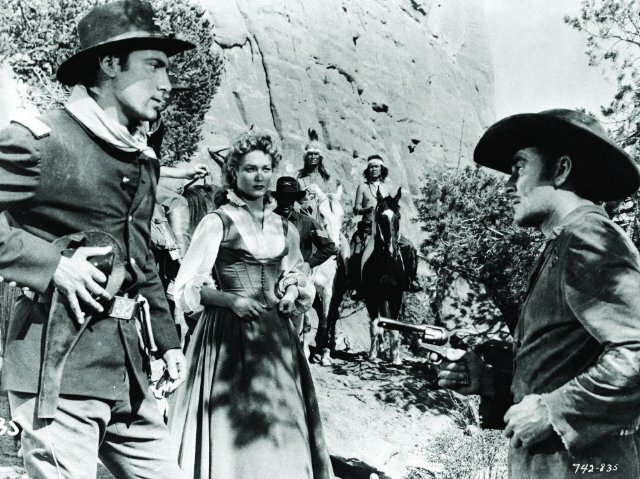 There are two survivors: the driver Gil Craigie (Chubby Jones) and a passenger, Johanna Carter (Patrice Wymore, in only her second movie), on her way to meet her cavalry fiancé at Fort Churchill. This complicates matters for Barstow, since he can’t just let them go and draw the cavalry to him, and he can’t leave them to the mercies of the Shoshonis. Trapped on Rocky Mountain, they run low on water and food. [Spoilers follow.] Matters are further complicated when Barstow and his men capture a small cavalry patrol led by Lt. Rickey (Scott Forbes), Johanna’s fiancé, who is searching for her. The patrol’s Indian scouts turn out to be Man Dog, head Shoshoni chief, and his sons. The Shoshonis make an escape attempt at night. Man Dog gets away to lead the Shoshoni uprising, but his sons are killed. 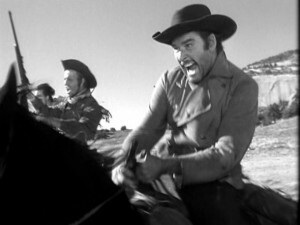 Barstow’s men have connected with the untrustworthy Smith, only to find his horse shortly after his departure, indicating that the Indians got him. That means his promised semi-army won’t be coming to the rescue Rickey makes a break for it, but the Confederates figure the Shoshonis got him, too, although matters won’t be much better for them if he got through. There is some chemistry between Barstow and Johanna, but neither acts on the attraction in the desperate situation. Barstow (Errol Flynn) leads his men in a final charge. Finally, Barstow leads his men on an attempt to break through the surrounding Indians and draw them away from the driver and Johanna. It works in the sense that the Shoshonis follow Barstow as he intended, but Barstow’s small group is vastly outnumbered and trapped in a box canyon. As the Confederates turn to face their pursuers in a desperate last stand (similar to Flynn’s situation as Custer in They Died With Their Boots On), they battle gamely but fall one by one to vastly superior numbers. Barstow apparently gets Man Dog, but falls with two arrows in his back. Rickey’s cavalry shows up only in time to rescue Johanna and Craigie and offer Barstow and his men a respectful burial, raising a Confederate battle flag on the stones of Rocky Mountain. Flynn could play both sides in the Civil War; he was both a Union officer (Virginia City, They Died With Their Boots On, Silver River) and a Confederate or former Confederate (Dodge City, Rocky Mountain). Sometimes he was even both, as in Santa Fe Trail, where he plays West Point graduate and future Confederate cavalry commander Jeb Stuart. Here, a prematurely aging Flynn (at 41) is noble but more subdued than he sometimes played; it makes him seem appropriately war-weary. His chemistry with co-star Wymore is real. Three months after shooting wrapped, she became Flynn’s third wife in Monte Carlo. 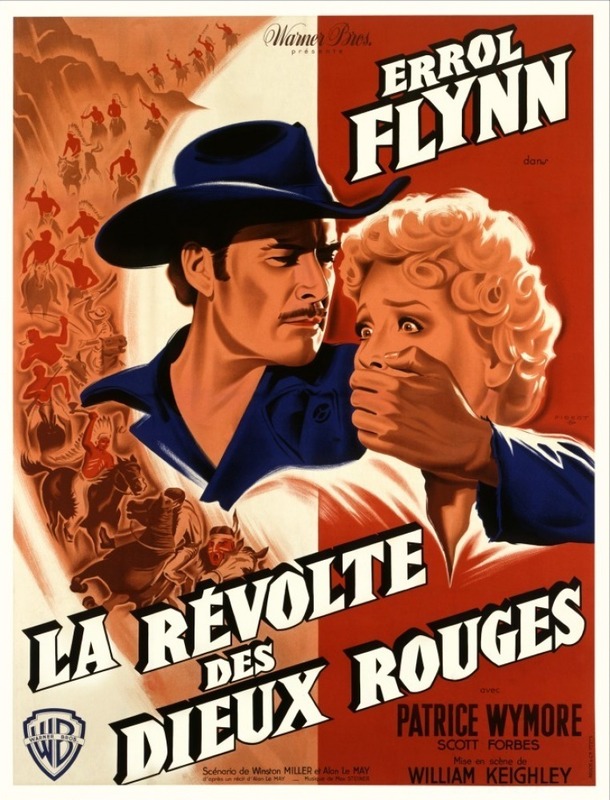 This is not one of Flynn’s best westerns (Dodge City, Virginia City, They Died With Their Boots On), but it’s worth watching. It’s better than Santa Fe Trail, San Antonio and Montana, and slightly better than the melodramatic but underrrated Silver River. 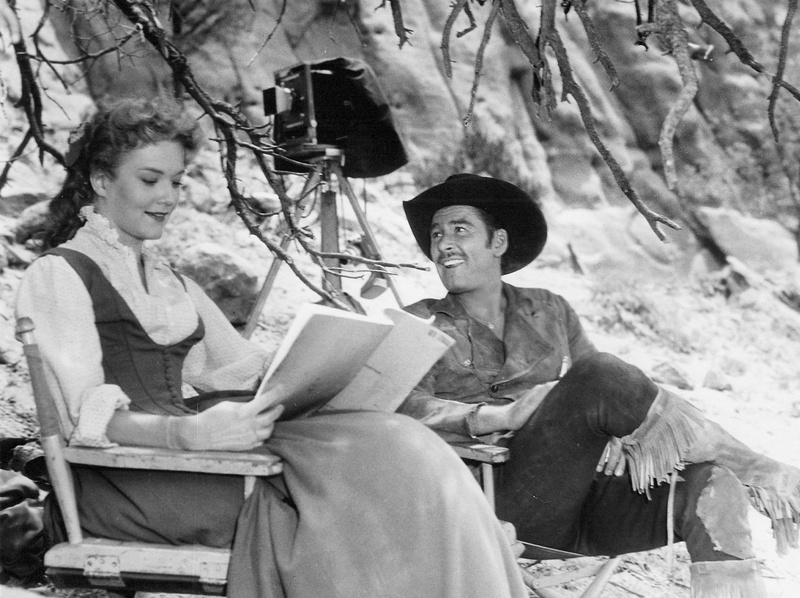 Patrice Wymore and Errol Flynn review the script on the set. This was the first film for Slim Pickens and Sheb Wooley, both of whom had rodeo backgrounds. Former child actor Dickie Jones, as the youngest of the Confederates, could ride well, too. Chubby Johnson is particularly good as the stage driver, who is not overtly hostile to the Confederates. Flynn’s carousing friend Guinn Williams (Dodge City, Virginia City) has a small part as the oldest of the Confederates, and is more restrained than he sometimes played. Scott Forbes is stiff as the Union cavalry officer fiancé, but he wouldn’t really have a chance against Flynn’s charisma. This is based on a short story by Alan LeMay (author of the The Searchers), who also co-wrote the screenplay with Winston Miller. The story goes that In 1949 Ronald Reagan complained to Warner Bros. about some of the films he was assigned to, and asked to do a western. The studio agreed if he would bring them a good story. Reagan brought them “Ghost Mountain” by LeMay. 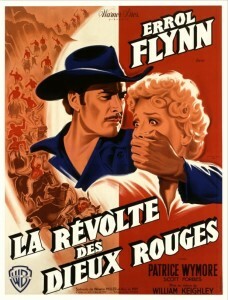 Despite their promise to him, Warner Bros. cast Errol Flynn in the lead. Shot in black and white by cinematographer Ted McCord (Treasure of the Sierra Madre, The Hanging Tree) around Gallup, New Mexico. The night scenes are quite dark. Music is by Max Steiner. Comparatively short, at 83 minutes. This entry was posted in Westerns Worth Watching and tagged Cavalry Westerns, Civil War, Errol Flynn, Native Americans (Indians) on December 12, 2014 by Nicholas Chennault.